“History if not forgotten is the guide to the future”- a rhetoric that aptly defines the contours of China’s present relations with Japan. Wherein, the exemplary to this logic can be found in China’s recent massive “Military Parade” held on September 3, to commemorate the 70th Anniversary of the World War II. The parade symbolised China’s “victory of the Chinese People’s War of Resistance against Japanese Aggression and the World Anti-Fascist War”. What is noteworthy is that for China even after 70 years, Japan’s repeated “apology” for its wartime past does no good in the present. In this context, it becomes imperative to probe into as to “why Japan’s apology makes no difference to China?”. The answer to this query lies in probing deep into the roots of history where the Chinese consciousness suffers from a victim mentality syndrome. It is a well-known fact that China and Japan are the two most influential powers in East Asia which are tied in the rubric of geographical proximity, economic interdependence and most importantly a shared history of two-thousand years- which is characterized by a long history of cultural, economic and political interaction. Given this deep connect; it is in the rational interest of both the countries to build a strategic partnership in order to seek mutual benefits. But what is surprising to note is that, China’s policy towards Japan amidst complex interdependence exhibits a departure from the realist rational behaviour. That is, there is a chronic illness caused by ‘history’ that has become an anathema in China-Japan diplomatic relations. For China, the actions towards Japan are regulated by the consciousness of brutal memories of the past. It is clear that China in its foreign policy behaviour towards Japan does not follow the traditional realist framework where national interest is seen the rational choice. 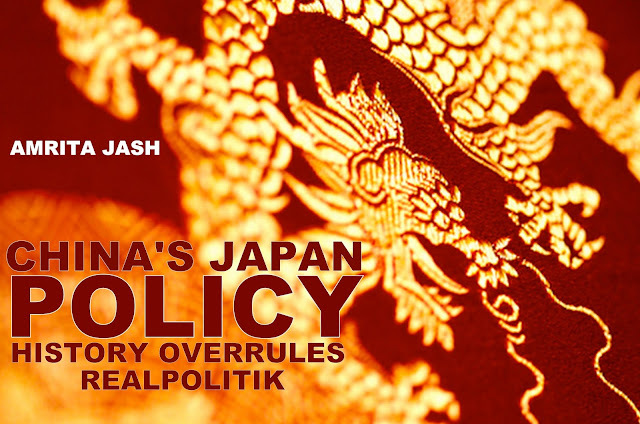 Rather China exhibits a departure from this traditional norm as its policy towards Japan goes beyond the fixed contours of national interest. For China’s Japan policy is predominantly driven by the historical consciousness of national memory and identity. Such ideational factors override the materialist forces. The strong sentimental rhetoric weighs down the realist state behaviour, where it is argued that nation-state’s actions are interest driven, but in case of China, it is rather consciously memory driven. Therefore, the presence of such memory politics between China and Japan clarifies a paradox. Wherein, the burgeoning economic integration between China and Japan have not succeeded in mitigating the grievances of the past. As for China, history acts a religion in practicing its relations with Japan. That is, in contrary to its responsible image, China perceives Japan as an irresponsible and belligerent power burdened by a deep seated deficit of trust resultant of a historical trauma. This very image of an irresponsible and belligerent actor is a direct outcome of Japan’s erstwhile image of an ‘imperialist power’. In this respect, China’s behaviour is guided by its belief wherein China’s image of the ‘other’ (Japan as irresponsible) to that of its ‘self’ (China as responsible) acts as a key perceptual driver that shapes China’s Japan policy. Holding this perception of ‘self versus the other’, China’s relations with Japan have been guided by the philosophy of “taking history as the mirror and looking forward to the future”, which has been motivated by the bias of “never forget national humiliation”. Hence, in this light, China’s such historical memory driven perception that of a distrustful Japan impedes the process of reconciliation. This sustains the inherent suspicion towards Japan that significantly outlaws China’s positive attitude towards Japan. Hence, what stands true is that China’s Japan policy is ruled by the rationale of history.